Transportation • Riders burn 1 million calories in six weeks. Steve Griffin | The Salt Lake Tribune GREENbike, Salt Lake City's bike-share program, has been wildly successful in its first six weeks. Here bikes are ready to go at the Gallivan Center on Monday June 3, 2013. Steve Griffin | The Salt Lake Tribune GREENbike, Salt Lake City's bike-share program, has been wildly successful in its first six weeks. Here bikes are ready to go at the Gallivan Center on Monday June 3, 2013. Steve Griffin | The Salt Lake Tribune GREENbike, Salt Lake City's bike-share program, has been wildly successful in its first six weeks. Here bikes are ready to go at the Gallivan Center on Monday June 3, 2013. What&apos;s green, has two wheels and just burned 1 million calories? 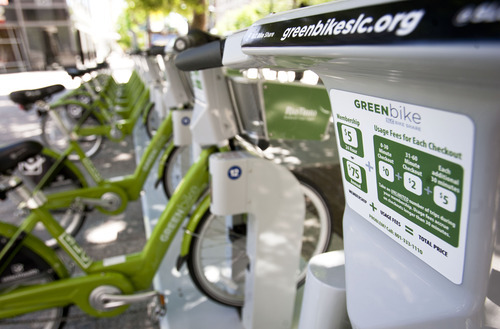 It&apos;s GREENbike, Salt Lake City&apos;s wildly successful nonprofit bike share program. In the first six weeks of operation, 54 bicycles at 10 stations made 6,000 trips, according to officials. Each bicycle was ridden an average of 111 times by about 2,000 users who burned an estimated 1 million calories. GREENbike expects about 5,500 users during its first year, organizers said. That means during its first year of operation, 77,000 miles won&apos;t be driven in autos and 20,000 cold-car starts won&apos;t add to air pollution, according to City Hall spokesman Art Raymond. 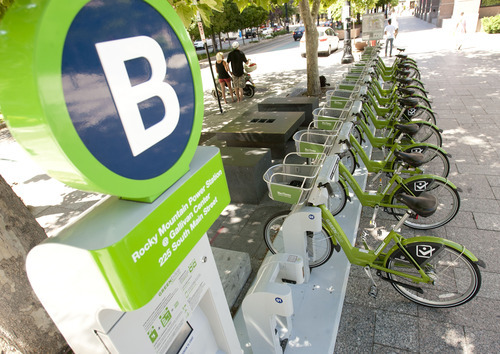 GREENbike is operated by the business organization Downtown Alliance in conjunction with Salt Lake City. The success of GREENbike "has surpassed expectations in every way," said Downtown Alliance Executive Director Jason Mathis on Monday. 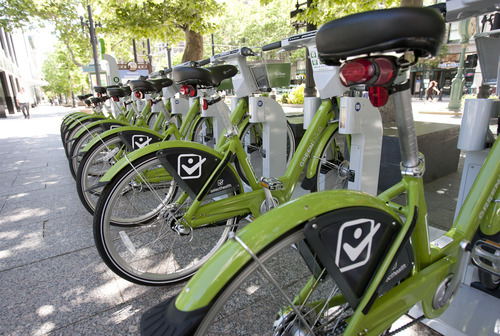 Salt Lake City is on pace to outstrip Boulder, Colo.,&apos;s first year of bike sharing. Boulder launched its program in 2011 with 14 stations  four more than Salt Lake City  and recorded 7,000 users making 17,000 trips during a year. Mathis credited the Downtown Alliance program&apos;s director, Ben Bolte, who had previously worked for Salt Lake City&apos;s transportation department. Already, plans are being made for expanding the system. "Ben has mapped out 30 potential stations downtown," Mathis said. "And we&apos;ve identified $400,000 in additional funding."